Mid-August Quanton formally announced the first event in our DX Seminar series. 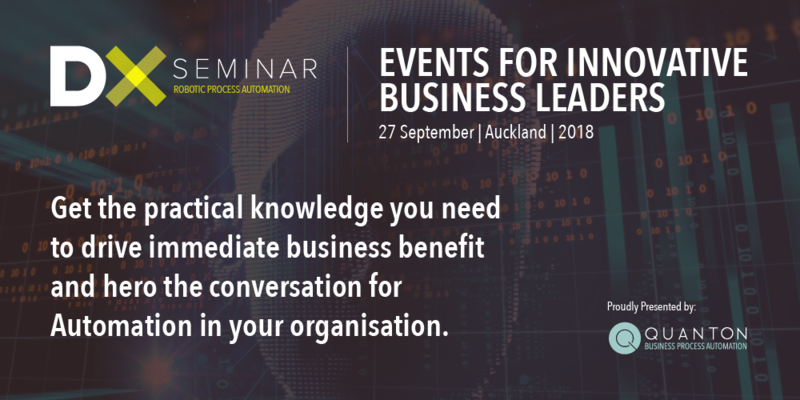 Taking place on September 27th in Auckland, the event is designed to give innovative business leaders the practical knowledge they need to hero the conversation for Robotic Automation within their organisations. 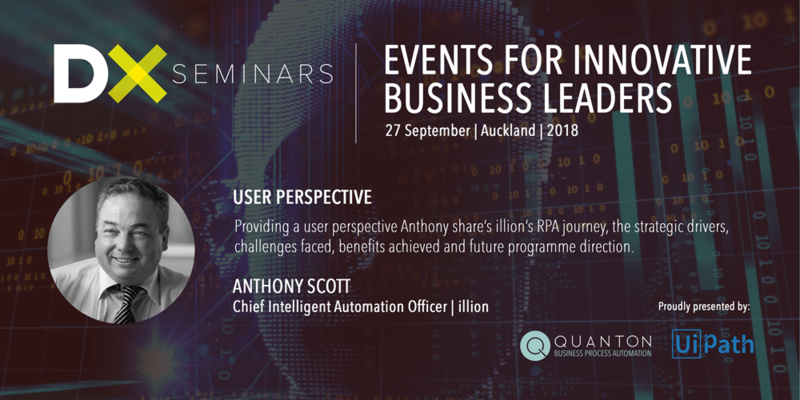 With a focus on Robotic Process Automation (RPA) and the emerging opportunities of Intelligent Process Automation, we are excited to begin officially introducing the speakers who will be sharing their knowledge and experience at the September event, starting with Anthony Scott, Chief Intelligent Automation Officer (CIAO) for Australia and New Zealand at illion. illion (formerly trading as Dun & Bradstreet) is the leading independent provider of trusted data and analytics products and services in Australia. With the company's consumer and commercial credit registries representing a core element of Australia and New Zealand's financial infrastructure. illion leverages its consumer and commercial credit registries, which comprise data on over 20 million individuals and over 2.5 million active companies, to provide end-to-end customer management solutions to clients in the financial services, telecommunications, utilities and government sectors. Anthony has a long history in the financial services industry including consultative work relating to RPA strategy and development, programme management, business process, business process design and IT service management. It is a vital position that forms the bridge between IT and business operations in the organisation. It doesn't just focus on Artificial Intelligence (AI) and Robotic Automation, it's about bringing an automation mindset to the operation that will have an impact across the entire business. Before joining illion Australia and New Zealand, Anthony was the General Manager of Robotics, Automation & Transformation for Equifax as well as several senior management roles other financial services organisations including TAL Insurance, Westpac, Commonwealth Bank, BT Financial Group and Barclaycard. In his session RPA practitioner, Anthony will discuss his organisation's use of Robotic Automation. The interactive session will talk about the value of these new technologies for businesses and will also cover some of the challenges that intelligent process automation poses for contemporary operating models including the speed of innovation. Anthony will note some of the applications of these new technologies that illion has benefits from. He will also flag some of the areas that business leaders should be focusing on to fuly prepare for the opportunities that RPA offers. This will be a dynamic presentation in which the audience will have the opportunity to interact and ask questions. Key ideas included in this presentation will relate to these five questions. 1. What are the drivers for automation? 2. What does this technology deliver? 3. How does this technology improve customer service, reduce compliance costs and impact your business's risk profile? 4. How does a strong governance framework improve the usage of RPA and process optimisation? 5. Where does RPA sit in the organisation and how does it integrate successfully with IT and the business? This is a rare opportunity to hear a leading Australasian RPA practitioner sharing their knowledge and experience for the benefit of New Zealand business leaders and an opportunity not to be missed. Anthony joins a line-up of speakers including James Bradley (UiPath), Alex Bartley-Catt (SpaceTime) and Quanton's own Sam Osborne who supported the inception of New Zealand's first RPA programme. On Thursday we'll introduce the second of our key speakers and will also be announcing our final key speaker for the event.